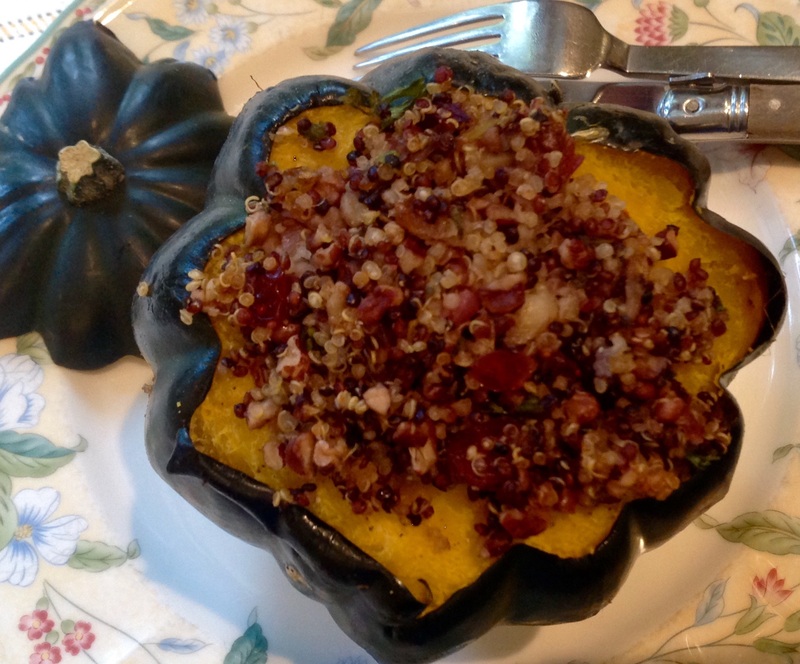 Whole stuffed squash are not only nutritious, they are a gorgeous meal-in-a-bowl, right from nature. Full of flavor, they can easily be adapted to what is in your pantry. You can use any mixture of grains, any combination of herbs and switch up the fruit and nuts. The addition of diced sausage or pancetta will satisfy any carnivore eaters. 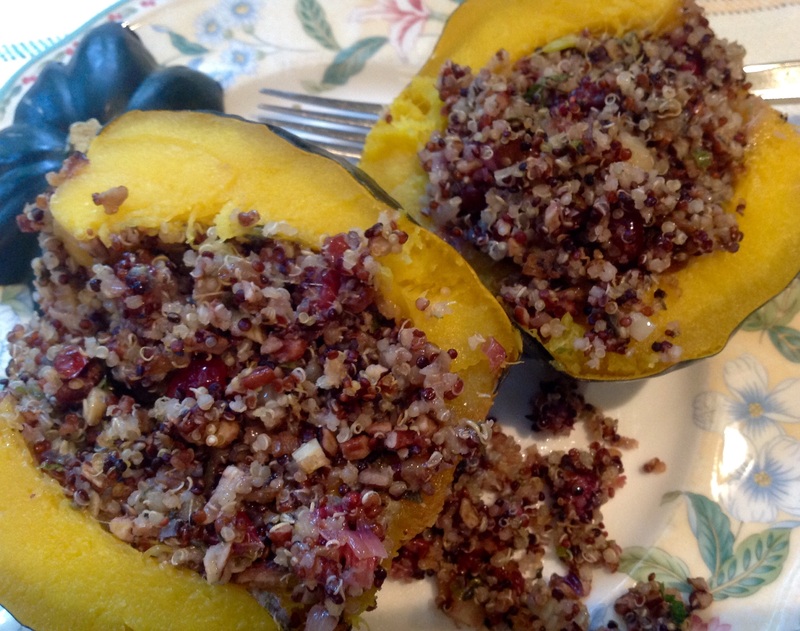 My version features a herbed quinoa- cranberry stuffing with chopped pecans. Get creative with your own combination and bring fall to your table. 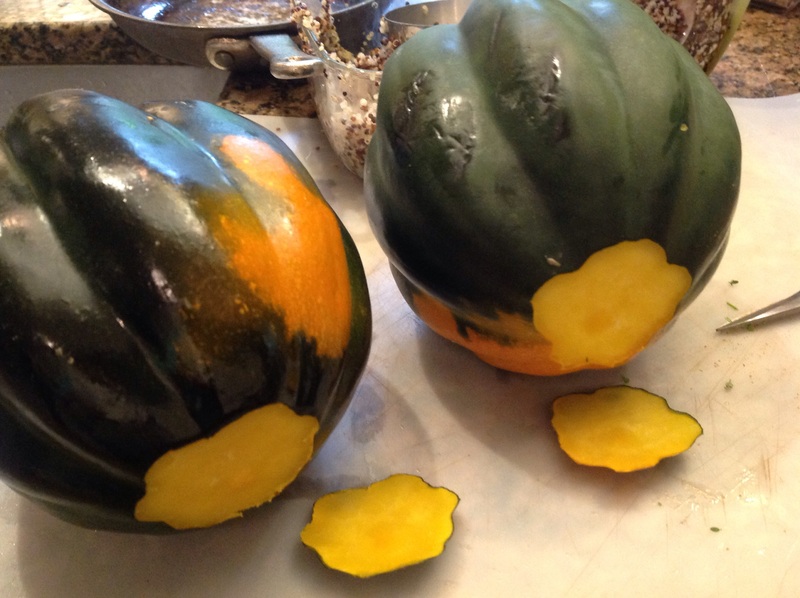 1- Cut the tops off your squash and reserve. 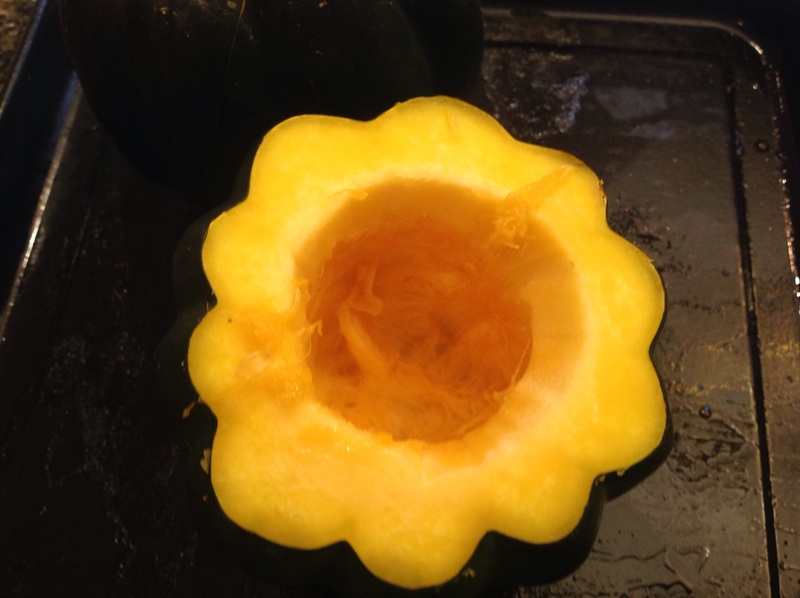 Cut a thin slice off the bottom so the squash can sit flat. Clean out the seeds and remove membranes. Salt and pepper the inside of squashes. Rub cavity and edges with a bit of olive oil. Place the top back on the squash and roast on a rimmed baking sheet for 30 minutes. 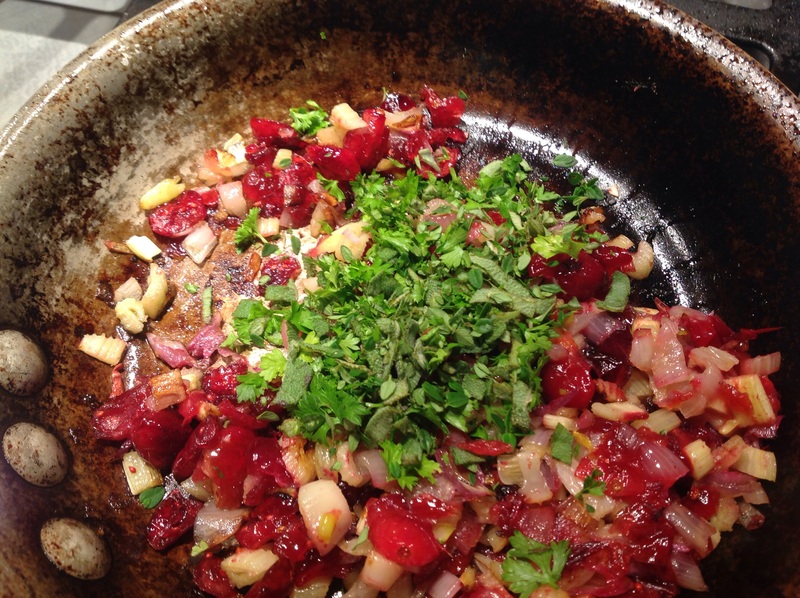 2- In the meantime, sauté the celery and shallots in the oil until soft. 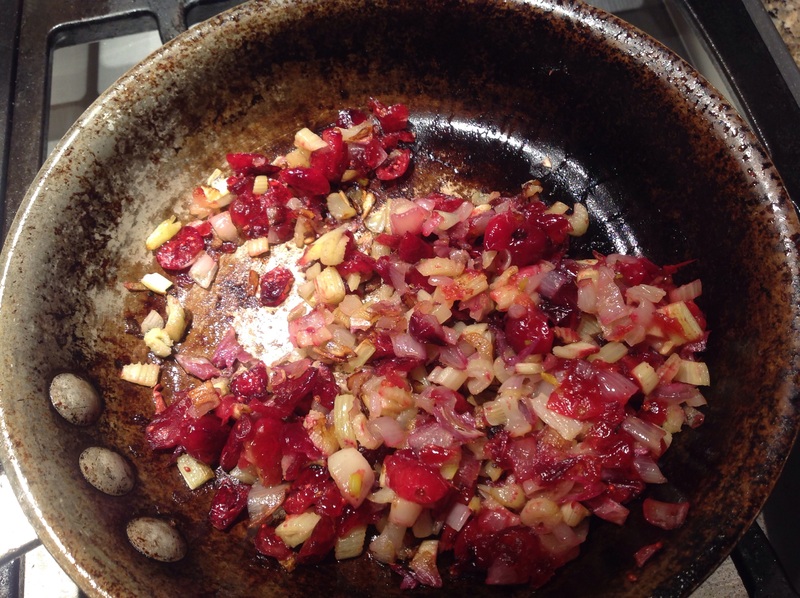 Add the cranberries, pecans, herbs, and cumin and cook for 2 minutes, to plump up the cranberries and meld flavors. 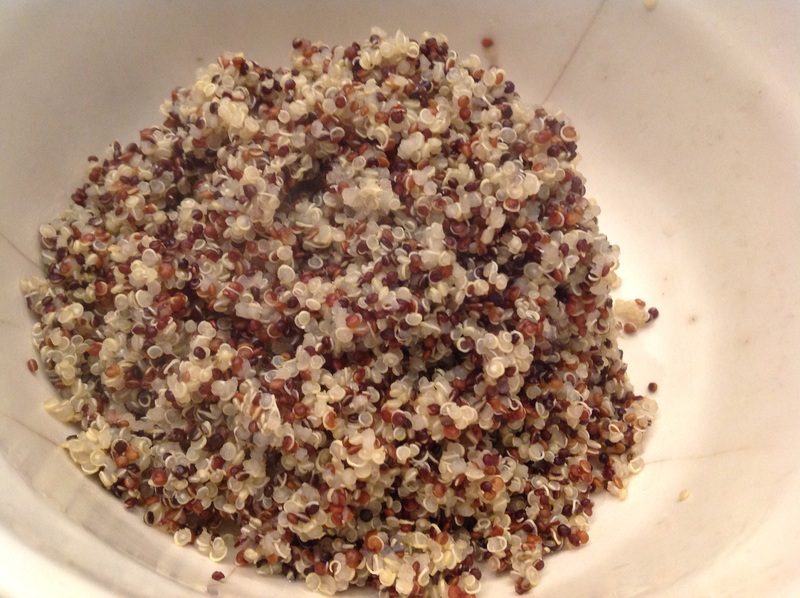 Combine this mixture with the cooked quinoa. Add the maple syrup and mix well to distribute. 3- Remove suqash from oven and reduce heat to 350F. Place squash back on the baking sheet and fill with the stuffing, mounding it above the edges. Cover the stuffing loosely with foil. Add about an inch of water to the pan and bake for an additional hour, until the squash is soft. 4- To serve, plate with the squash tops on the side for presentation panache. The whole squash can be served for an entrée portion or the squash can be cut in half to served as appetizer or side portions. 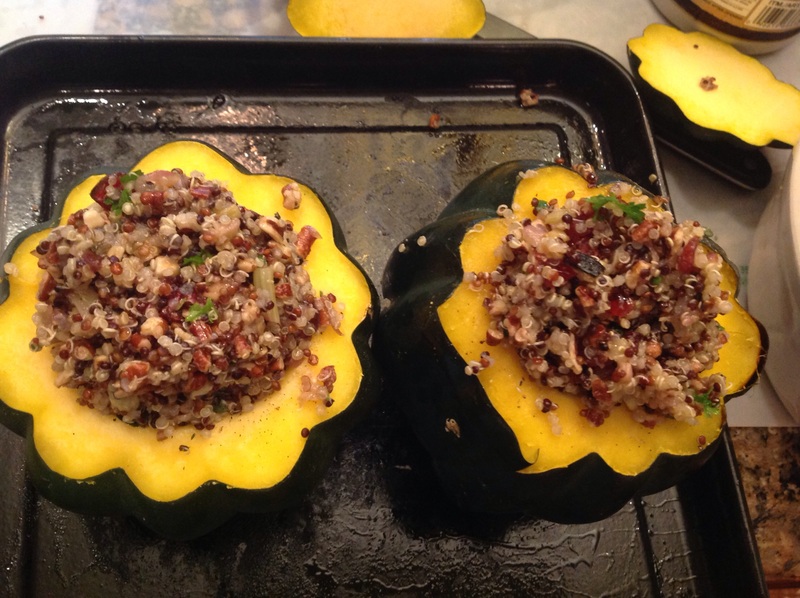 This entry was posted in Entertaining, Recipes and tagged Cranberry pecan stuffed acorn squash, fall stuffed whole acorn squash, quinoa cranberry stuffed acorn squash by Johanne Lamarche. Bookmark the permalink. Bravo! Another absolutely stunning dish Johanna. 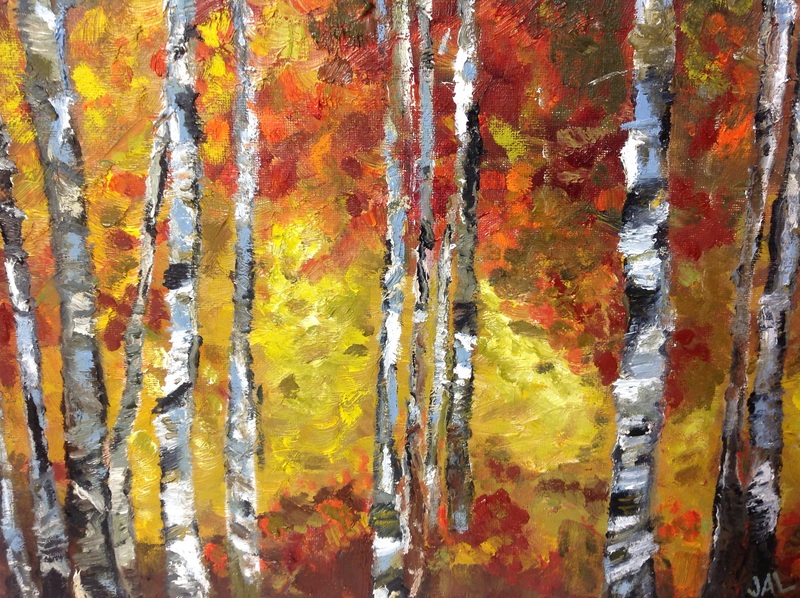 Thank you Jacqueline! So nice to know you are reading the blog 🙂 and sharing it in Holland. Merci!!! See you at book club. Gosh, you just remind me about my 2 package of quinoa that almost ages in my kitchen counter…..
sure this it hearthy for my taste buds and healthy for my periodontal tissues doc!!!! I’m happy to motivate you to cook your forgotten quinoa Dedy! Can’t wait to see what you create with it. I am certain it will be interesting! I love to see an acorn squash recipe that isn’t overly sweet and doesn’t have marshmallows or some other horror!! This looks great, so I’ve got to pin it! It was really tasty and a whole meal. Whatever you’ve got in the fridge goes! My youngest son is a freshman in a southern college and came home asking apif I’d ever heard of marshmallows with squash…YUCK!